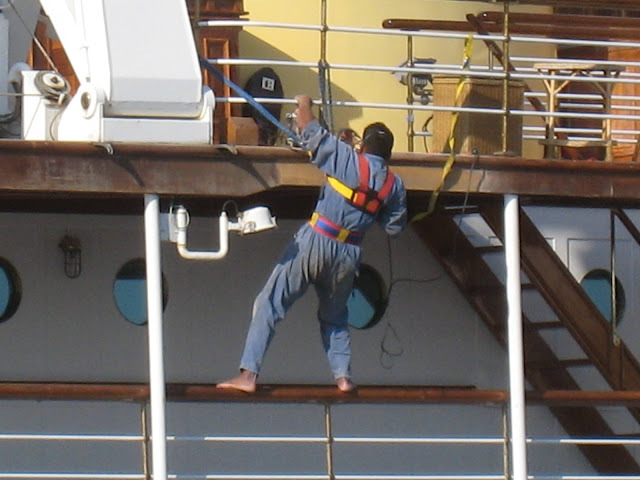 This guy has his safety harness in place. Come back tomorrow and I'll show you the yacht he's working on - it's big one. I thought at first I would see a second picture of him either dangling from a rope of splashing around in the water. This old man's post brought tears on this Veteran's Day but not because I am a Korean War era veteran. I'm curious to find out, so I shall be back. I've also enjoyed browsing here. That rock/barbed wire statue is odd but alluring. Great catch for its spontaneity! I imagine want kind of yacht it is. I shall see tomorrow.